Paradise Found in Loreto, Baja Sur! Mexican Hacienda Style home with room for guests set in a tranquil setting. 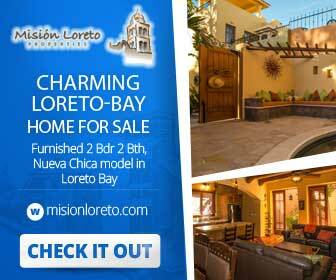 Seize this outstanding opportunity to own a piece of paradise among the palms in Loreto, Baja Sur! This unique property is comprised of five bedrooms and five baths, and is perfectly situated back from the street, within a short walking distance from the heart of the historic downtown and just steps away from the beach. This property is full of traditional Mexican details like talavera tile, Saltillo tile floors and brilliant color. Stroll down the stone path and enter through the gate into a magical courtyard garden oasis. A water fountain welcomes you and immediately sets a mood of tranquility. The many features of this well maintained and delightful property include; a pool, a hot tub, a poolside bar and palapa. The combined dining room, living room and kitchen space is truly the heart of the main house. The open-plan kitchen and dining area is ideal for entertaining and a tiled island counter connects the cooking and dining areas. In the kitchen the rich warmth of the saltillo floor and vibrant color of the talavera tile is balanced by the use of stainless steel in the six burner gas range/oven. The saltillo floor seamlessly extends to an expansive outdoor patio that wraps around the entire house, and the eight foot full length glass doors in the living area can be opened up to remove the barrier between indoors and outdoors and create one spacious living area. Stairs from inside the main house lead up to the one bedroom apartment with a full kitchen, which also has a separate entrance from the outside. This space features a wrap around deck, a sun patio and many windows that let in the light and a filtered view to the Sea Cortes. Across the garden courtyard are two guest rooms, decorated and painted with traditional Mexican colors, each with their own doors opening onto the tropical garden and sharing a full bath. The possibilities are endless and the ideal lifestyle awaits…… Grab the chance to own this special property!